Anyone who has either visited Grand Teton National Park or looked at photos from there has probably seen the Thomas Moulton barn pictured in this photo. 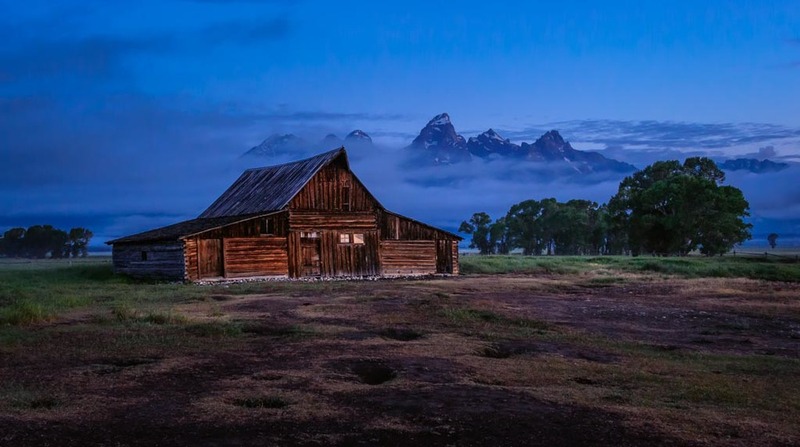 It is probably the most photographed barn in the United States, and it is a mecca for photographers who want to capture the sunrise with both the barn and the top of the Tetons lit up (I did get that shot and will posting it in the near future). Every morning there can be dozens of photographers lined up to shoot the barn. I am sure that when Thomas Moulton built this barn in 1913 (it is celebrating it's 100th birthday this year), he didn't realize that he was building a photographic landmark. All he was doing was building shelter for his horses so that they could survive the harsh Wyoming winters. The barn is located off of Antelope Flats Road in an area known as Mormon Row (Thomas was a member of the Church of Latter Day Saints). On the other side of the road, another barn still stands that was built by his brother John, but is not as famous. There is an effort to raise money to help restore the barn as the National Park Service has run short of funds and private fundraising is being solicited by those who revere the barn. For those of you who are interested, here is the link to the fundraising site.